Spiridoula Demetriou, a Ph D candidate in the Department of Art History at the University of Melbourne will present a lecture on the creation of modern Greece, on Thursday 29 September 2016, at the Greek Centre, as a part of the Greek History and Culture Seminars offered by the Greek Community of Melbourne. Revolutionary Mesologgi provided a focus for Philhellene rhetoric that supported the 1821 Greek War of Independence. Ms Demetriou’s examination of Philhellene art explores the subjective manner in which representations of Mesologgi reinforced supportive western beliefs about the Greek War of Independence and the intellectual creation of modern Greece. Philhellene art reveals that the conceptualisation of modern Greece involved a historical process grounded in the dual locations of the imagination and politics. This study focuses on the themes of the vanquished hero and the Christian identity of the insurgents because these were important projections onto the defenders of Mesologgi. Paradoxically, the defeat of the town in April 1826 served to further highlight that the War could not be resolved in favour of the Greek insurgents without western intervention. Greek War of Independence iconography also involved the conjuring of a negative image of the Ottoman Empire that elicited Philhellene sentiment. Philhellene art promoted Greek identity, culture and its continuity in relation to antiquity and consequently contributed significantly to what constituted Hellenism, even before the formation of the new nation state was accomplished in the 1830s. 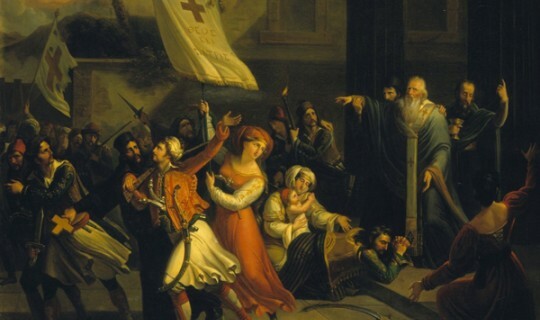 Apart from 19th century Philhellene representations of Mesologgi elevating the town to a potent emblem of revolutionary Greece and liberal political values across the globe, they have also acquired political longevity in the context of Greek nationalism. Spiridoula Demetriou is a Ph D candidate in the Department of Art History at the University of Melbourne. After obtaining a Bachelor in Economics, she undertook post-graduate studies in Modern Greek (language and literature). An interest in Greek culture prompted the commencement of a doctoral thesis on Mesologgi and Philhellenism.